THE EARRINGS ARE LISTED IN ANOTHER LISTING! GORGEOUS F-G COLOR AND VS CLARITY UNTREATED NATURAL DIAMONDS AND 100% NATURAL HUGE COLOMBIAN EMERALD. EXTREMELY HIGH END - TOP QUALITY NECKLACE. THIS IS A CUSTOM MADE TOP QUALITY RARE EMERALD AND DIAMOND NECKLACE. THE NECKLACE HAS A STUNNING DIAMOND STUDDED MULTI STRAND DESIGN ACCENTED WITH LARGE SOLITAIRE DIAMONDS AND A HUGE SPRING GREEN SHADE EMERALD. THE DIAMOND STRANDS ARE CONNECTED TO A LARGE PENDANT WITH A HUGE 10.85CTS COLOMBIAN EMERALD. THE NECKLACE IS COVERED WITH 9.35CTS OF BRILLIANT CUT NATURAL DIAMONDS. THE EMERALD HAS BEEN CERTIFIED BY 3 GEM LABS INCLUDING GIA (USA) TO BE A NATURAL COLOMBIAN EMERALD WITH COLORLESS OILING. PLEASE SEE PICTURES OF REPORTS. THE EMERALD ALONG WITH THE NECKLACE HAS BEEN CERTIFIED BY 4 DIFFERENT GEM LABS. ALL CERTIFICATES WILL BE SENT WITH THE NECKLACE. THE NECKLACE HAS ALSO BEEN APPRAISED BY A LOCAL JEWELER. THE APPRAISAL WILL BE SENT WITH THE NECKLACE. THIS NECKLACE IS STUDDED WITH 6 LARGE MARQUISE / PEAR BRILLIANT CUT DIAMONDS ADDING UP TO 0.96CTS AND 8.39CTS OF ROUND BRILLIANT CUT DIAMONDS. THE NECKLACE HAS COMBINED 9.35CTS OF NATURAL VS F-G BRILLIANT CUT DIAMONDS. THESE GORGEOUS "EYE CLEAN" AND COLORLESS - NEAR COLORLESS DIAMONDS ARE GRADED VS CLARITY, F-G COLOR AND THE NATURAL EMERALD HAS A STUNNING SPRING GREEN COLOR , SO YOU CAN BE ASSURED OF THE EXCELLENT BRILLIANCE, SPARKLE AND FIRE. 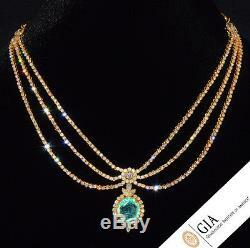 THIS NECKLACE IS SET WITH A HUGE 14.24MM X 12.67MM X 8.62MM, OVAL CUT EMERALD. THE EMERALD HAS A DESIRABLE VIVID SPRING GREEN COLOR WITH A SLIGHT BLUE HUE. THIS IS A 100% NATURAL EMERALD, NO ARTIFICIAL COLORING, NO COATING, NO RESIN FILLING. THE EMERALD HAS GOOD SEE THROUGH WATER LIKE CLARITY, WITH NATURAL TRANSPARENT INCLUSIONS. NO BLACK SPOTS, NO BLACK LINES, NO CLOUDINESS. VERY RARE FOR AN EMERALD OF THIS LARGE SIZE. THE EMERALD CONSTANTLY SPARKLES AND SHIMMERS. THERE IS NOT A SINGLE PALE OR DULL AREA. IN THE PICTURES THE EMERALD MIGHT LOOK LIGHT GREEN OR DULL DUE TO THE CAMERA FLASH, BUT ITS NOT. IT HAS A SPARKLING SPRING GREEN COLOR. THE DIAMONDS ALSO MIGHT LOOK YELLOW OR GRAY, BUT THEY ARE NOT. THE DIAMONDS FEATURE A BRIGHT WHITE COLOR. THE DIAMOND ARE VS CLARITY F-G COLOR. THE EMERALD IS VERY SHIMMERY AND SPARKLY AND HAS A BEAUTIFUL PLAY OF COLOR DUE TO ALL THE FACETS, HUGE SIZE AND SEE THROUGH CLARITY. THE EMERALD DISPLAYS BEAUTIFUL INTERNAL FLASHES OF DARK GREEN, LIGHT GREEN, NEON GREEN AND GREENISH BLUE COLORS. THE OVAL BRILLIANT CUT EMERALD MEASURES 14.24MM X 12.67MM X 8.62MM , SO IT IS A VERY GOOD, LARGE EMERALD. THE EMERALD WEIGHS A JAW DROPPING 10.85CTS. THE EMERALD IS IN PERFECT CONDITION, NO DAMAGE, NO SCRATCHES, NO CHIPS. THE EDGES OF THE EMERALD ARE ALSO IN PERFECT CONDITION. THE NECKLACE IS VERY INTRICATELY MADE WITH ATTENTION TO FINE DETAIL. THE DIAMOND STUDDED CHAINS ARE FLEXIBLE AND MOVE FLUIDLY. THE NECKLACE ADJUSTS AROUND THE NECK VERY ELEGANTLY. PLEASE DO HAVE A LOOK AT THE VIDEO OF THE NECKLACE ABOVE AND THE MANY PICTURES BELOW SO YOU CAN SEE THE EXACT CONDITION OF THIS NECKLACE, EMERALD AND DIAMONDS. THIS NECKLACE IS SET WITH NUMEROUS ROUND, MARQUISE AND PEAR BRILLIANT CUT DIAMONDS. THE LARGER PEAR DIAMONDS MEASURE 5MM X 3MM. 20CTS EACH, MARQUISE DIAMONDS MEASURE 4MM X 2.5MM. 12CTS EACH AND ROUND DIAMOND MEASURES 4MM WIDE. THE HIGH QUALITY NATURAL DIAMONDS AND EMERALD ARE SET INTO SOLID HEAVY 18K YELLOW GOLD. THE NECKLACE MEASURES ABOUT 15 1/4 INCHES LONG, BUT CAN BE ADJUSTED UP TO 16 1/4 INCHES WITH THE HELP OF THE ADDITIONAL LOOPS IN BACK. THE NECKLACE DROPS 1 1/2 INCH IN CENTER. THE NECKLACE IS STAMPED AND LASERED ALONG WITH A DIAMOND SYMBOL ON SIDES. THE FOLLOWING STAMPS ARE ON THE NECKLACE, "18K" "750" "DMP-0.96" (MARQUISE AND PEAR CUT DIAMONDS) "DR-8.39" (ROUND BRILLIANT CUT DIAMONDS) "E-10.85" (EMERALD). SO YOU CAN BE ASSURED OF THE EXACT SPECIFICATIONS OF THIS NECKLACE. THE NECKLACE WEIGHS OVER 42.1 GRAMS. THIS CUSTOM DESIGNER NECKLACE WITH DETAILED CRAFTSMANSHIP AND AMAZING DESIGN IS MAGNIFICENT IN PERSON AND WILL LEAVE YOU SPEECHLESS!! THIS IS AN AMAZING CHANCE FOR YOU TO OWN A PIECE OF FINE ART THAT IS FIT FOR A QUEEN. THIS BEAUTIFUL NECKLACE IS GUARANTEED AUTHENTIC AND HAS BEEN VERIFIED AND TESTED BY LOCAL JEWELERS. ALL OF THE DIAMONDS AND EMERALD ARE GUARANTEED 100% NATURAL GEMS. THIS NECKLACE HAS BEEN CHECKED AND CERTIFIED BY 4 DIFFERENT GEM LABS INCLUDING GIA. THE LAB CERTIFICATES WILL BE SENT WITH THE NECKLACE. THE NECKLACE HAS ALSO BEEN CHECKED, APPRAISED AND VERIFIED BY A LOCAL JEWELER. IT WOULD RETAIL FOR EVEN MORE!! THE EMERALD AND DIAMONDS ARE CERTIFIED 100% NATURAL GEMS. THE NECKLACE HAS ONLY BEEN WORN FOR SPECIAL OCCASIONS, SO IT IS IN EXCELLENT , SHOWROOM CONDITION. PLEASE BE SURE TO LOOK AT ALL THE PICTURES AND THE VIDEOS TO SEE THE CONDITION OF THIS NECKLACE AND THE GEMS. THE PICTURES AND VIDEO ARE PART OF THE DESCRIPTION AND SHOW THE EXACT CONDITION OF THIS NECKLACE. THE AMAZING DESIGN, TOP QUALITY HUGE EMERALD, VS CLARITY AND F-G COLOR DIAMONDS AND EXPERT CRAFTSMANSHIP MAKE THIS A MUST HAVE FOR A WOMAN WITH EXQUISITE TASTE IN FINE JEWELS. THIS WILL LEAVE YOU SPEECHLESS AND EVERY TIME YOU WEAR IT, YOU CAN BE SURE TO GET LOTS OF COMPLIMENTS FOR IT. THIS LISTING IS OF THE NECKLACE ONLY. THE EARRINGS ARE LISTED IN ANOTHER LISTING. ALSO PLEASE BE SURE TO CHECK OUT MY OTHER ITEMS AND ADD ME TO YOUR. The item "GIA 20CTS Natural VS F Diamond Colombian Emerald 18K Solid Gold Strand Necklace" is in sale since Monday, January 4, 2016. This item is in the category "Jewelry & Watches\Vintage & Antique Jewelry\Fine\Retro, Vintage 1930s-1980s\Necklaces & Pendants". The seller is "exoticfinds01" and is located in Lubbock, Texas.